A group of over-50 Deschutes County residents got their groove on as music from a Wiggles children’s tape streamed from speakers. Behind them a kitchen was ready for the brain-beneficial menu next on the agenda. The fun had just begun. It was the first day of a four-part Nourishing Boomers and Beyond program, a pilot project by Oregon State University’s Extension Service in Deschutes County in partnership with North Dakota State University, where the curriculum was developed. 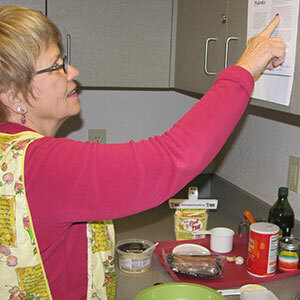 Patty Stark checks the polenta recipe as she prepares a meal in the Nourishing Boomers and Beyond course in Deschutes County. Photo by Glenda Hyde. The plan is to repeat the course in June and have the program picked up by other counties, said Glenda Hyde, an Extension Family and Community Health educator in OSU’s College of Public Health and Human Sciences. who started the project. Created to help boomers prevent chronic diseases by taking charge of their health, the course touches on strategies for nourishing the brain, skin, digestive system and heart. After the first class, she was convinced. The dancing, she said, was a kick, and she’d had no idea how important it is for brain health. The cooking segment was even more meaningful for Stark, who is gluten intolerant and has a family history of heart attacks, stroke and Alzheimer’s. Learning to make a gluten-free blueberry buckle made an impression on her, as did a salmon salad with lemon-tarragon dressing. In the second class on caring for your skin, Hyde introduced facial masks made with ingredients like avocado, whipping cream, carrot, yogurt and flaxseed. She asked everyone to make and try one. 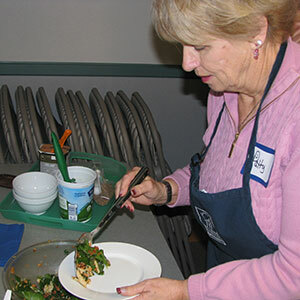 Patty Stark dishes up smoked salmon salad, a recipe she learned in the Nourishing Boomers and Beyond course in Deschutes County. Photo by Glenda Hyde. When the class made oven-roasted sweet potatoes with walnuts, brown sugar and spices, they found out sweet potatoes are even more full of cancer-fighting antioxidants than blueberries. The gluten-free, whole-grain cornbread made with brown and white rice flour, potato and tapioca starch was a revelation, too. “Nobody could believe how good it was,” Hyde said, adding that ingredients provided by sponsor Bob’s Red Mill went home with participants to encourage them to make the cornbread and other recipes on their own. Hyde taught more hands-on cooking in the classes on the digestive system and heart, including a popular breakfast dish of whole-grain polenta, wilted spinach, grated Parmesan cheese, mango and just a bit of sausage. Read this story on OSU Extension Service’s page. About the OSU Extension Service: Created in 1911, the Oregon State University Extension Service provides the public with easy-to-understand, research-based knowledge through workshops, hotlines, about 900 publications, online assistance, videos, and faculty in each of Oregon’s 36 counties. It adapts the research for practical, local uses by farmers, ranchers, foresters, families, gardeners, youths, seniors and coastal residents. Its programs include 4-H and Master Gardeners.